War season is upon us. Not only have the Grime scene’s MC’s been going at it, but now has come the time for producer’s to get busy too. BeatBoss, the genre’s #1 clash tournament for producers, returns for its 8th instalment. You’d only have to take a trip back to 2015 to discover the first BeatBoss, yet it feels like long ago. Maybe this is due to the fact that so much has happened since. Birthed on Grime’s latest flagship station, Mode FM, the tournament has grown exponentially thanks to founder and CEO, Tiatsim. The dynamic DJ has presented his House Of Grime show on Mode FM for as long as I can remember and continues to keep his finger on the pulse. 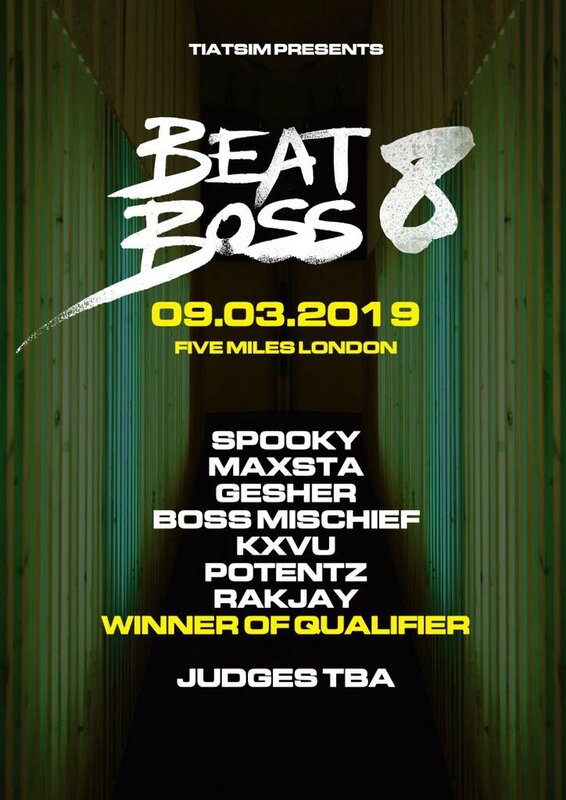 Each edition of the tournament sees a selection of Grime’s finest producers, hand-picked by Tiatsim and the BeatBoss team (sometimes with the assistance of a qualifier or two), to battle it out for the BeatBoss crown. The tournament layout is simple. 8 producers from all corners of the country come together armed with a USB containing their most war ready material. The first round is pre-decided through a randomised sorting system and after that the Semi-Final and Final take their course. The first edition, hosted by Capo Lee and won by Familiar Face, took place live at Mode FM – the growth in venue ever since is an indictment of its popularity. This year’s event – brought to you with the ferocious energy of longstanding host Hitman Tiga – will be held at Five Miles, a North London bar, and there will undoubtedly be a squadron of Grime fans there to bear witness. So then, “who’s the current crop of contestants?” I hear you ask. Let’s take a look at each producer, their most recognised track and what I think they can offer this latest instalment of BeatBoss. A true Grime vet, succinctly summarised by the man himself: “they were bussin’ bludclart skidmarks in their f***ing Spiderman briefs before they even met the likes of me”. This was SlewDem Crew’s official DJ in the first generation of Grime – the fact he is still here and relevant is testament to his skill, authenticity and work ethic. Given his experience and reputation it’s hard to look past Spooky as a potential BeatBoss champion, yet you never know what the war may bring. Known for his rumbustious remixes, Spooky’s second round is one to keep your eye on (should he make it there, of course). Having produced for the likes of Stormin, Wiley, and Capo Lee, it’s hard to pick the most renowned Spooky instrumental. That being said, I’ll put forward one of my personal favourites (and definitely one suitable for the war): Toxic Gas. From a member of Grime’s first generation, to a member of its latest. Rakjay burst onto the radar last year with a string of releases, most notably alongside the MC of the moment, Logan. Rakjay has previously stated that he takes inspiration from Bristol duo Kahn & Neek, and that’s clearly evident in his style of 140. Equipped with head-nodding percussion and basslines fit for a sound system, this is going to be a very interesting match-up in terms of styles. Styles make fights, as they say, and Rakjay could be a real dark horse of this tournament. His most distinguished work so far comes alongside Logan, displayed in the deep, dark instrumental of their collab Shellington Season. From the audience’s perspective, not much is known about Nottingham native Gesher. His beats have been blasted on radio stations up and down the country and have subsequently earned him the respect of his Grime scene contemporaries. Making appearances on Rinse FM’s The Grime Show as far back 2016, his pedigree is not to be overlooked. Having previously collaborated with reigning (and retired) BeatBoss champion Jammz, I’m sure he‘ll have a few tricks up his sleeve for all three rounds – specifically the remix round – his most famed track coming in the form of a Rock With You – Michael Jackson refix. South Coast resident Kronzy was the worthy winner of this year’s qualifier round, but that shouldn’t deter you from backing him for the title. Seeing off the likes of Lumes, Doeboy and Leberin is no mean feat and this achievement shouldn’t be overlooked. Being the co-founder of Reloaded Events, one of the biggest Grime & Bassline nights in the East Midlands, Kronzy should know a thing or two about generating crowd reaction. You can listen back to the BeatBoss 8 qualifiers via Mixcloud if you’d like to get a flavour of his style before the main event. With us just entering 2019, it’s about time Kronzy got his next break. I first came across him through his ‘Ozone’ instrumental a few years ago, and this is arguably still his biggest track to date. From one South Coast city to another, Brighton bossman Cub KXVU makes his way to centre stage for this year’s tourney. A soundclash scholar, KXVU is war ready and battle tested. Whether it’s seeing off various competition to make the Dubplate Dons final, or concocting a chaotic chop-fest in the kitchen, the Cub’s producer brain never strays too far from the battlefield. Now, though, he has genuine use for artillery. As head honcho of acclaimed label Southpoint, KXVU must deal with a vast array of Grime and Bass selections; that experience may prove invaluable when up against this kind of opposition. Also known for his Cub Chop’s, this is a another contender who may just come into their own in the remix round. A fervent planner and organiser, you should always expect the unexpected when it comes to KXVU. Aside from his refixes the Brightonian beatmaker has amassed huge amounts of radio play, and whilst it may not be his most known, his track Artorius Castus has caused some serious damage that we hope to see replicated on game day. We could be here all day speaking about Maxsta’s achievements behind the microphone, and whilst that isn’t entirely irrelevant, we’re here to focus on his expertise behind the keyboard. Using his alias Mitch 7, the now Grime scene veteran has combined his musical talent with the experience racked up over the years to put himself in the producer/MC combo category. Previously stating that he grew up “having the keys to the Roll Deep studio”, he saw first hand how the likes of Wiley, Rude Kid, Teddy Music and Blessed Beats put their tracks together. Having since spent time honing his craft and is now ready to test it on a competitive level; he’s developed an ear for the true, authentic Grime sound and that may just carry him the distance here. His most notable production credit sits nicely on his own song, last year’s Born On Your Own, featuring the one and only JME. 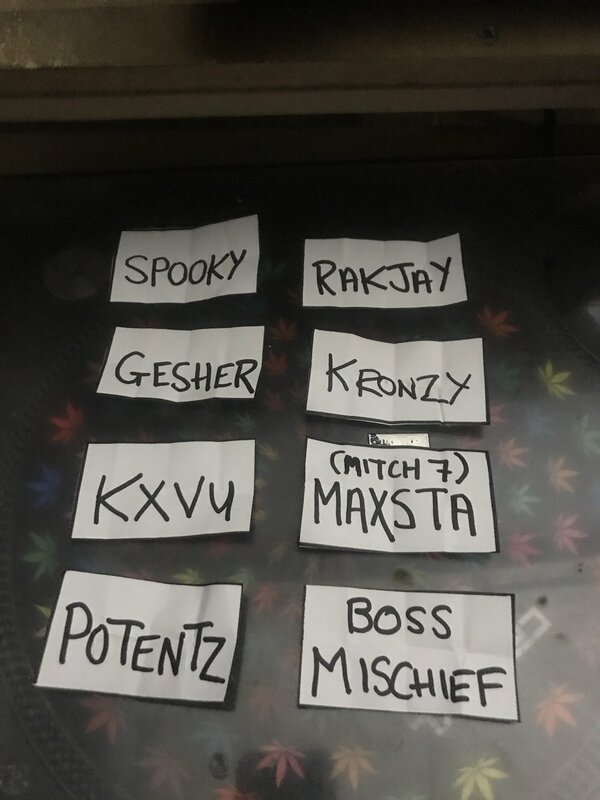 Pyro Radio regular Potentz will enter the ring for the second time this year, having first competed in a BeatBoss Live clash in 2015. During his clash with Boss Mischief he went about racking up four reloads which at the time, set a new Beatboss record. This record was eventually beaten by Beatboss veteran J Beatz who holds five against Rynsa Man. Having let off a salvo of war dubs in the past year or two, the North Londoner will enter the war fit for battle. Dabbling in Drum and Bass as well as Grime, the crowd will be anticipating that level of energy-infused production the moment Potentz takes the stage. Do not confuse his talents, though – he is still proving his worth on 140 to this day – with his instrumentals doing regular rounds on radio, whilst heading up his celebrated label Subheadz. Since taking his talents from North London to Northamptonshire, Mischief has really gained acclaim in the world of Grime and beyond. The instrumentalist has managed to translate fast paced, distinctive style onto remixes and refixes with great effect (just check the SoundCloud plays if you don’t believe me) but now it’s time to put his helmet on and head to the trenches. Packing a punch in production will undeniably come in handy throughout this tournament, as will his experience from working with the likes of Scrufizzer, Big Zuu, and GHSTLY XXVII. As mentioned, this is another competitor who may shine in the remix round, yet that shouldn’t distract you from his skill set with original music. Mischief is also BeatBoss alumni, taking part in the inaugural event; let’s see how much the producer has progressed. His most prominent track does come in the form of a refix, a very weighty one at that: the Slim Shady edit still doing numbers to this day.